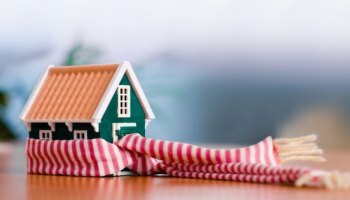 With the weather going from hot to cold, there are a lot of good ways to prep for protecting your home and minimizing energy expenses. Here are some tips to get your property winterized. Make sure you keep the cold out and the heat in. Check the seals on windows, doors, piping coming into the home, electric lines coming into the home, exterior exhaust grills and attic fan venting to stop unwanted air flow. Foundation cracking and weather strips on garage doors require more than just caulking, but a quick sweep of the exterior should identify those issues. Exterior maintenance is important before it gets too cold. Check for cracks in your driveway, walkways and brick. Handrails need to be secured so when ice is on the ground, you can rely on that support. A roofing professional should make sure there are no leaks in the roof and that the gutters have been cleared out. Trim back tree branches that are close to your home and walkways, so they will not be at risk to break with the weight of snow. Disconnect hoses and shut off valves that run to exterior water-spouts. Winter to HVAC professionals is like tax season to accountants, so get your equipment serviced now before it is too late! Check filters to make sure air flow is not impeded. Have your fireplace cleaned and inspected for regular use. Re-program your thermostat schedule so you stay comfortable without major ups and downs for your interior heat. Change the direction of your ceiling fans to create an upward draft to redistribute warm air. Prepare for power outages by stocking up on firewood and replacing batteries in flashlights, smoke detectors and carbon monoxide detectors. Re-organizing your mud and utility rooms is very helpful. Having the right equipment in place for snowy months is better done while it’s still warm out. Take out your snow blower and make sure it is in working order. Bring your shovels, ice melt and snow boots to accessible areas. When putting away your lawn movers and other gas powered lawn equipment, drain out left over gas in the tank. Checking these items off your list will give you head start on enjoying your holiday season.